Home decor, especially Kashmiri home decor, has always been a shopping favourite, so when we stumbled upon The Asian Arts in Andheri East, a 12-year-old establishment, we decided that we had to pay it a visit, if not for a big purchase, but to just admire the varied arts and crafts in our country. 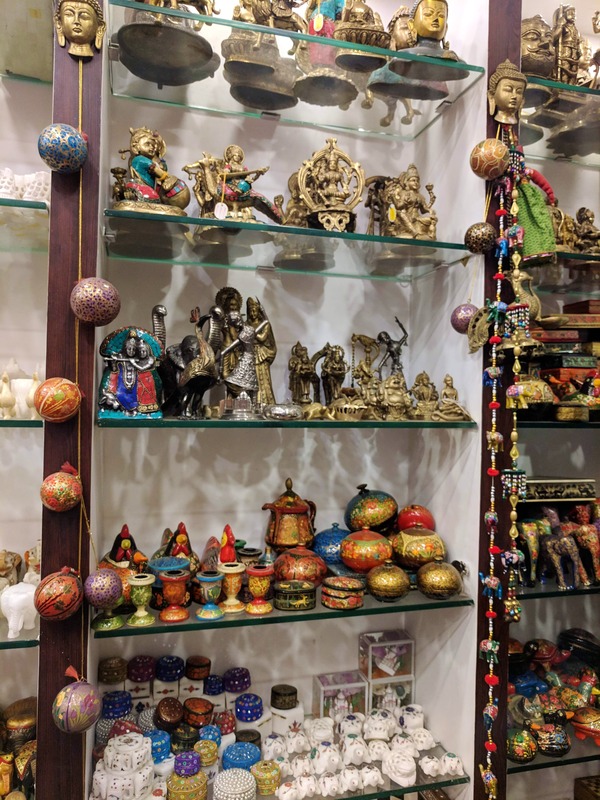 The store is as gorgeous as we imagined it to be, rows upon rows of papier mache boxes, figurines, bangles, decorative pieces in the shape of animals, trees and others, all handpainted to perfection with a colour combination that can steal hearts away. We deliberated on what we liked more, the boxes or some brass figurines that were right above them. While the papier mache decor starts at INR 300, the brass decor can start from INR 1,500 for smaller pieces and the bigger ones can range up to INR 10,000 too. They also had wooden figures with the wood supplied from Karnataka and Kashmir, lovely designs that can make for statement pieces. The range can start at INR 1,000. Then, come the luxurious carpets. With three varieties in tow - silk, cotton and a mix of silk-cotton; you have machine-made carpets in the 4"-6" variety that start at INR 10,000 and even silk carpets that are handmade (takes a few months) that can sell for as much as INR 45,000. They even have semi-precious stones as inlay work on smaller carpets are just meant for display. The price, I believe, is something you only ask if you're keen to make that purchase. Since it's a Kashmiri store, you're sure to find stoles and shawls in Pashmina and even cotton, that are affordable and in a range of colours. Beyond that, they stock up on precious and semi-precious stones that can be turned into jewellery (they have pretty sets and even lose stones) and even silver jewellery that is ethnic and heavy to hold. Apart from this, they even have a section that has all sorts of teas you can imagine, perfect for gifting to those friends who can't go without a cup a day or even the ones who like to experiment with different flavours. The staff is really friendly and will take you around the store, explaining their origins as they walk along, showing you a bit of this and a bit fo that, and then, opening up and showing you some of their treasures. We've loved every minute of our time here and with such lovely hosts and a great collection, we'll be popping by ever so often to pass on a piece of gorgeousness to our near and dear ones.